Foods For Long Life: Instant Pot Sweet And Sour Red CabbageCome See My Valentine's Day Tree! 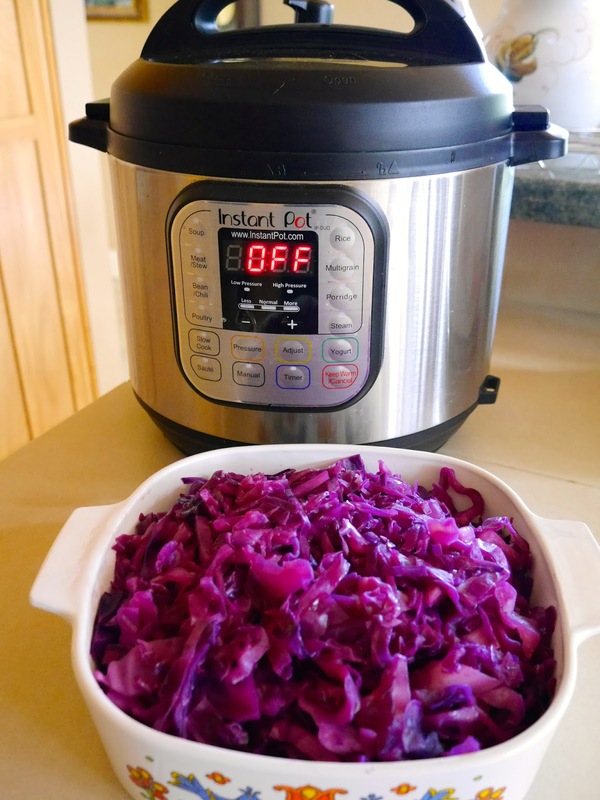 Red cabbage in 3 minutes in an Instant Pot Pressure Cooker. In case you missed me, I've been traveling in South America. I'll be telling you all about my travels to Buenos Aires, Uruguay, and Brazil in the next few weeks once I've sorted out all my pictures. The local food, wine and dancing made this a very memorable trip. OK, I admit that cabbage isn't the most romantic food I can think of for Valentine's day but it's red and it's good for the heart (it helps lower cholesterol) so I'm going with it! 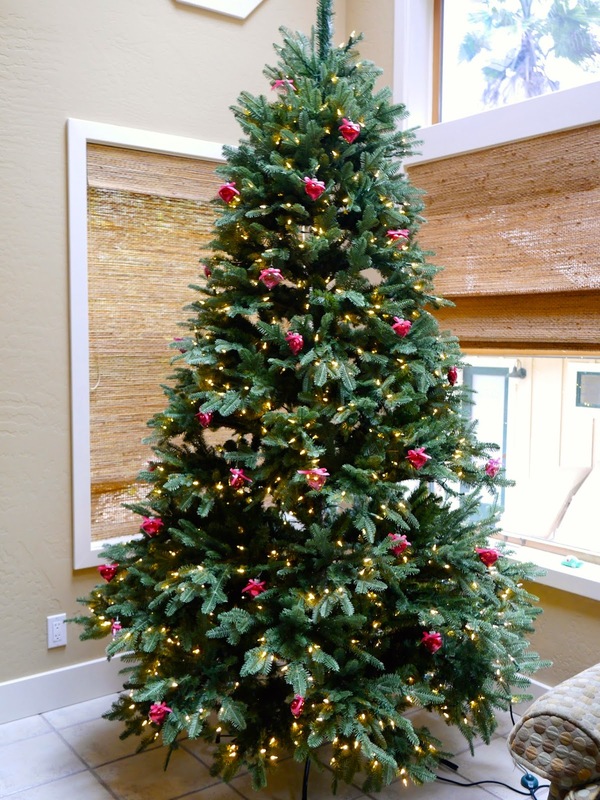 I really enjoyed my new Christmas tree this year. It's artificial (I'm allergic to the real ones) and it came with lots of pre hung LED lights . I just didn't want to take it down. So I renamed it a "celebration tree", decorated it with "heart ornaments" so that we could enjoy it for Valentines Day. Not sure how long my celebration tree will stay around. Could there be bunnies soon? 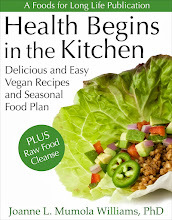 Today's recipe is very similar to one of my favorite recipes, Sweet and Sour Red Cabbage and Apples, which is in my eBook, Health Begins in the Kitchen. This simplified version omits the apples, making this a very low calorie dish (57 calories per serving) and prepares it in an Instant Pot Pressure Cooker. Once the pot gets up to pressure it only takes 3 minutes to prepare. More importantly, it cooks it to perfection every time without the hassle of stirring and cooking down the liquids. Requires an Instant Pot Electric Pressure Cooker or similar appliance. Cut the red cabbage in quarters vertically. Slice off the center core from each quarter and thinly slice. Place the cabbage and all other ingredients into the Instant Pot. Don't worry that it fills more of the pot than is recommended. The cabbage will shrink when cooked. Make sure the top vent is closed. Hit the manual button and set for 3 minutes. After the pot comes up to high pressure and cooks for 3 minutes, hit the off button and do a quick release of the pressure. Carefully remove the lid, tilting it so that the steam escapes in the back. Stir the cabbage, adjust the salt and pepper if needed and serve. Per Serving: 57 calories, 0.2 g total fat, 0 g saturated fat, 0 mg cholesterol, 64 mg omega-3 and 49 mg omega-6 fatty acids, 2 g protein, 14 g carbohydrates, 3 g dietary fiber, and 185 mg sodium. Just made this today after finding your recipe via a google search. Came out fabulous, of course I changed almost everything because I do this with recipes, heh. I used balsamic instead of apple cider vinegar, peppered bacon salt instead of salt & pepper and added a little garlic powder and chili ancho powder. Still tasted fantastic though. Recipes are always just a "suggestion". Glad your version came out great! I just made this with 1/4 ground cloves and sliced granny smith apple. OMG. Good. I usually throw in some apples but I've never tried it with cloves. Nice touch - must try! So easy and good! Used technique, but just used some basalmic and no sugar, didn't make sweet and sour. Added chopped scallion and chopped raw fennel. Delicious. The Instant Pot does not cease to amaze me. Thanks for your recipe. Balsamic has its own sweetness - sounds like a nice combination! I made this, uncharacteristically, exactly as your recipe said. Very tasty!